General Characteristics: Medium in height, erect, moderately stocky, maturing within 12 to 15 months, producing from 5 to 10 oha resembles Piko Uaua very closely, but the petiole is white at base rather than pink. Petiole: 60 to 100 cm. long, dark green, usually edged narrowly with dark pink or red, white at base. Leaf blade: 30 to 45 cm. long, 25 to 35 cm. wide, 20 to 35 cm. from tip to base of sinus, ovate, nearly horizontal, firm-chartaceous, light to dark green; piko whitish; lobes obtuse with narrow sinus. Corm: Flesh chalky white with yellowish fibers; skin cream-colored. Inflorescence: Peduncle green; spathe 15 to 20 cm. long, the lower tubular constricted portion 3 to 4.5 cm. long, green, usually tinged with red at base, usually open partially exposing the ovaries, the upper portion deep yellow; spadix 5 to 6 cm. long, the sterile appendage about 4 mm. long. Origin, and derivation of name: Native variety; derives descriptive name, Uliuli, from dark green petioles. Distribution: Widely planted on all the islands, especially Oahu, almost exclusively under wetland culture. Use: A very important commercial poi taro. Remarks: This variety used to be grown extensively at Kaanapali, Maui, a region of strong winds, which caused the leaves to be torn–hence the local name Haehae. 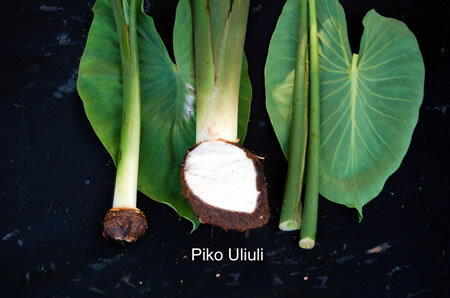 It is considered hardier than Piko Kea and shows less rot, especially in the lowlands where the irrigation water is warmer.